Opening the high-level segment of the 18th Conference of the Parties to the UN Framework Convention on Climate Change, UNFCCC, Ban said, “The danger signs are all around,” citing the unprecedented melting of icecaps, rising sea levels, and land degradation and drought around the world. Delegates at the two-week conference that ends this Friday will, among other goals, try to extend the Kyoto Protocol, whose first commitment period expires in just 20 days – at the end of 2012. The Secretary-General said he hopes for five key “deliverables” by governments in Doha this week, beginning with the adoption of a ratifiable second commitment period of the Kyoto Protocol. 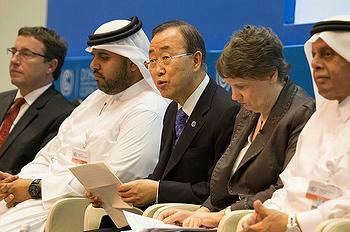 The secretary-general also expects progress on long-term climate finance, and ensuring that the Green Climate Fund and the Climate Technology Centre and Network, set up at previous UN climate negotiations in Cancun and Durban to support mitigation and adaptation by developing countries, are fully equipped and effective. 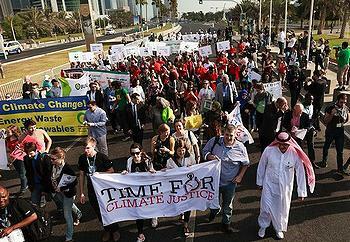 In addition, he expectes governments to demonstrate, with no ambiguity, that negotiations on a global and legally binding instrument remain on track, and to show how they intend to act on the gap between mitigation pledges and what is required to achieve target of keeping global average termperature rise below two degrees Celsius. 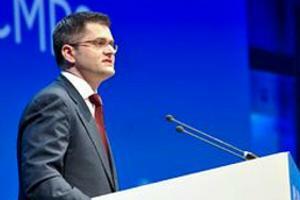 President of the UN General Assembly Vuk Jeremic told the meeting that addressing the problem of climate change must become a core national interest of every UN Member State. Every delay will require greater future effort or will mean greater future harm, he warned echoing similar warnings from scientists from around the world. “If we act together with clear purpose, we can meet this challenge. But we need to be united – governments from all regions, business and civil society. We have a clear choice: stand together, or fall together,” Ban emphasized. It all comes down to money, and the funding for climate change action is falling short, worrying developing countries and nongovernmental organizations. Global annual investment to curb climate change reached US$364 billion in 2010/2011, according to a new reporton climate finance released at Doha by the Climate Policy Initiative, an independent, not-for-profit organization. This amount falls short of most estimates of investment needed to limit global warming to two degrees Celsius, finds the report, “The Global Landscape of Climate Finance 2012,” the most comprehensive global climate finance mapping effort to date. By comparison, the International Energy Agency, says US$1 trillion each year is needed in incremental investment in the energy sector alone to promote low emissions growth. The report projects that much more will be needed to achieve climate-resilient development globally. In 2012, the private sector was the main source of global climate finance, with corporations and renewable energy project developers contributing between $217 and 243 billion, the report shows. Public sector investment totaled between $16 and 23 billion globally. Most public sector investment acted as a catalyst for private investment through incentive mechanisms and subsidies that helped to lower investment costs. Public and private intermediary organizations such as national development banks and commercial banks raised and channeled between $110 and 120 billion, providing support for projects that would otherwise not be viable. “The fact that the public policies and incentives are starting to unlock private investment is good news for policymakers dealing with limited budgets,” said Barbara Buchner, director, Climate Policy Initiative Europe, one of the principal authors of the report. Despite calls for cooperation, nongovernmental organizations are warning that the UN climate talks are being blocked by the rich industrialized countries whose negotiators refused to discuss finance commitments, leading to an “empty page” proposal on the issue in a draft text. 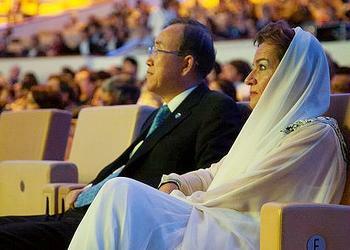 “The empty-white page matches the climate finance pledges of developed countries under the UN climate convention. Empty in 2013. A big zero,” said Chee Yoke Ling, director of the Third World Network, a Malaysian nongovernmental organization. “Several independent studies have shown that the previous round of climate finance promises weren’t met. Previous promises were not entirely new nor additional to existing foreign aid and they did not meet the agreed level,” said Brandon Wu, climate campaigner at Action Aid International, based in Washington, DC. “Those broken promises threaten to break the talks. If the U.S. and others continue to refuse an agreement on new levels, on transparency and on sources then developing countries should consider walking away from the table completely,” said Wu on behalf of Action Aid, which works with over 15 million people in 45 countries to eliminate poverty and injustice. These observer groups are concerned that the future of the Green Climate Fund is in doubt. “Currently the Green Climate Fund stands empty of public dollars, with developed countries threatening to starve the Fund unless the private sector can have unfettered access.” said Janet Redman, a senior policy analyst at the Institute for Policy Studies, a U.S. thinktank.